A major denomination claims its authority on the premise that Jesus founded His Church on Peter. But was Peter actually the “rock” Jesus referred to? Matthew 16:18 has been used to claim Peter and those considered his successors were given nearly unlimited spiritual authority. Is this what Jesus said? Jesus had posed a question to His disciples: “Who do men say that I, the Son of Man, am?” Peter spoke up first—eventually giving the right answer (verse 16). Instead of just complimenting Peter for speaking correctly, Jesus Christ made a statement about rocks. “And I also say to you that you are Peter, and on this rock I will build My church, and the gates of Hades shall not prevail against it” (verse 18). Peter, Christ, rocks, church, gates of Hades. Christ packed a lot into this short statement! So what exactly was He talking about? This interpretation forms the basis of the doctrine of the primacy of Peter, the idea that Christ founded the church on Peter. He was the foundation and was given the “keys of the kingdom of heaven” (verse 19)—supreme authority to establish doctrine and govern the church. This theology leads to the connected doctrine of papal succession. The Roman Catholic Church believes Peter moved to Rome and led the church from Rome for about 25 years until his martyrdom in A.D. 67. They believe Peter started a succession of popes that continues unbroken to this day (from Pope Linus to Pope Francis I), and that each of these succeeding popes carries the same authority that Christ supposedly gave Peter in Matthew 16:18-19. Believing that Peter and those they claim are his successors are truly “the rock” on which Christ built His Church and are the possessors of the “keys,” the Roman Catholic Church has therefore claimed the authority to declare doctrine—even changing or adding to biblical doctrines. Catholics maintain that when a pope speaks ex cathedra (Latin for “from the chair” of St. Peter), he is exercising this power in its fullness. Ex cathedra asserts that “when the pope in his official capacity, with the fullness of his authority, as successor of St. Peter and head of the Church on earth, proclaims a doctrine of faith or morals binding on the whole Church, he is preserved from error” (John A. O’Brien, The Faith of Millions, 1963, pp. 110-111). In fact, one of the pope’s primary titles is vicar of Christ, which implies “his supreme and universal primacy, both of honour and of jurisdiction, over the Church of Christ” (Catholic Encyclopedia). The idea is that the pope stands in place of Christ as His representative on earth—endowed with Christ’s own authority—which was originally given to Peter. In A.D. 190, Pope Victor I declared that all Christians should abandon the biblical Passover, and instead observe Easter to represent Jesus’ resurrection. The Council of Nicaea later confirmed this and made it binding on the entire church (A.D. 325). On Dec. 8, 1854, Pope Pius IX declared the doctrine of the “Immaculate Conception,” which proclaimed that the Virgin Mary was “preserved free from all stain of original sin” and throughout her life was “entirely perfect, beautiful, most dear to God and never stained with the least blemish” (Ineffabilis Deus). On Nov. 1, 1950, Pope Pius XII announced the doctrine of the “Assumption of Mary,” declaring that the Virgin Mary’s body never died and saw corruption, but was “assumed body and soul into heavenly glory” (Munificentissimus Deus). Now, if you are a Protestant Christian reading this article, you may disagree with some of these Catholic proclamations. But don’t be too quick to disconnect your own faith from this topic. The fact is that Protestantism retained (and still believes and practices) many doctrines established by the Roman church using the authority they claim to derive from Matthew 16:18-19! Let’s look at one example. Does your church hold services on Sunday—believing that it is the “Lord’s Day”? Did you know that Rome was responsible for changing the biblical day of worship from the seventh-day Sabbath to Sunday? The Catholic Church itself is the first to admit it used its authority to make the change. Furthermore, Catholics have logically claimed that Protestants who observe Sunday do so only by recognizing the universal authority of the Church of Rome. “Now the Scriptures alone do not contain all the truths which a Christian is bound to believe, nor do they explicitly enjoin all the duties which he is obliged to practice. Not to mention other examples, is not every Christian obliged to sanctify Sunday and to abstain on that day from unnecessary servile work? … But you may read the Bible from Genesis to Revelation, and you will not find a single line authorizing the sanctification of Sunday. The Scriptures enforce the religious observance of Saturday, a day which we never sanctify” (The Faith of Our Fathers, 1917, pp. 72-73). If you go to church on Sunday, you are tacitly recognizing the authority of the Roman Catholic Church to change and add to biblical revelation. If this makes you uncomfortable, you may want to read more about the biblical Sabbath in our booklet The Sabbath: A Neglected Gift From God. So, was Jesus really building the Church on Peter (and his successors) in Matthew 16:18? Let’s look more closely at the verse. Peter’s given name was Simon Bar-Jonah, but Christ had given him the nickname Cephas—an Aramaic word meaning “A Stone” (John 1:42). Petros in Matthew 16:18 is the Greek form of the nickname. The meaning of both Cephas and Petros is the same: “a fragment, a stone” (Zondervan Expository Dictionary of Bible Words, pp. 537-538). The closest English words to petros would be pebble, stone or small rock. The second word Christ used was petra. This word also means rock, but it represents “a mass of rock” (ibid.). This word could be translated as boulder—an immovable mass. Had Christ intended to describe Peter, all He needed to say was: You are Peter and on you I will build My Church. 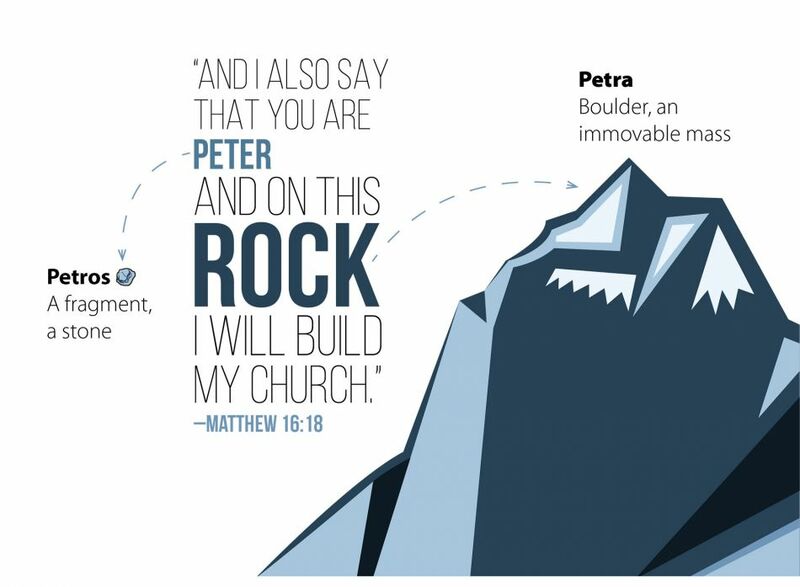 He distinguished the rock (petra) He was building the Church on from Peter (petros). The rock He was building His Church on was a rock big enough to serve as the chief cornerstone in the foundation; it was large, strong and immovable. This describes none other than Jesus Christ Himself! Jesus was not only the chief cornerstone, He is still the active “head of the body, the church” (Colossians 1:18; see also Ephesians 5:23). Christ did establish offices in His Church (Ephesians 4:11), but the Bible instructs those who hold offices of leadership to remain faithful to Christ’s teachings (1 Corinthians 11:1). Even Peter himself—far from claiming the authority some believe he was given—taught plainly that Christians “should follow His [Christ’s] steps” (1 Peter 2:21). You are Peter and on you I will build My Church. A Church that teaches and strives to live by “every word that proceeds from the mouth of God” (Matthew 4:4). In other words, a Church that bases its teachings solely on the Bible—not the traditions of men (Mark 7:7). A Church that keeps the same biblical Sabbath and holy days Jesus and the apostles did (Mark 2:27-28; Acts 18:21; 1 Corinthians 5:8). A Church that calls itself by the biblical name “church of God” (Acts 20:28; 1 Corinthians 1:2; 10:32; 11:16, 22; 15:9; 2 Corinthians 1:1; Galatians 1:13; 1 Thessalonians 2:14; 2 Thessalonians 1:4; 1 Timothy 3:5, 15). A “little flock” (Luke 12:32) that would often be persecuted (Matthew 24:9). A Church that strives to preach “the gospel of the kingdom” to the whole world (Matthew 24:14).